Australia have denied claims they deliberately lost a World Cup game to delay a meeting with the United States. The International Basketball Federation (Fiba) has opened disciplinary proceedings after Australia rested a number of players during a 91-83 defeat by Angola at the tournament in Spain. The result meant they finished third instead of second in their group. "Let us be extremely clear," said a Basketball Australia statement. "We always compete the right way." 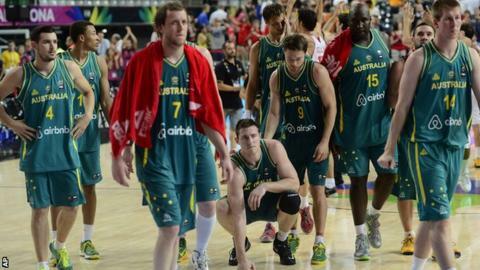 Australia went on to meet Turkey in the last 16 and were beaten 65-64. Basketball Australia added it had put forward a "strong and detailed" case explaining why they had rested some players because of injury and restricted the game time of others because of fatigue. In a statement, Fiba said: "The on-court behaviour displayed by Australia in that game generated huge disappointment by basketball fans and experts. It is widely suspected they lost the game in order to avoid having to face reigning world champions United States until the semi-finals."